May you burst into the New Year with strength and joy! This fireworks of a plant musters a fine display even as it grows literally between a rock and a hard place. Thank you all for keeping me company in 2010. 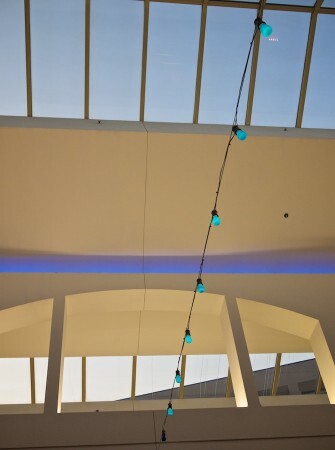 Twilight at the Ballston Mall, and scarcely a perpendicular to be found. I like the one burned out bulb and the wannabe Pleiades up at the top right. I have fond memories of dribbling a slurry of sand and seawater out of my fist, through the nozzle of my fingertips, to create sandcastles at the beach. The resulting constructions was Gaudiesque and baroque, but the oddly organic quality of the forms generated that way were deeply satisfying. They were both alien and familiar. So it was with a mild shock of recognition that I encountered the object shown here in the Hall of Gems at the Natural History Museum. It’s at the other side of the main Hall of Gems room (which holds the Hope Diamond) from a huge, but entirely conventional-looking quartz crystal. Amazingly, this thing is quartz too, but in this case it’s quartz sandstone. Imagine a beach of tremendously fine quartz sand becoming compressed, the crystals interlocking in non-crystaline ways, and then being subject to erosion or extrusion or some combination of both. This was the result. It is a very curious object indeed. Even people who haven’t visited Washington, DC, may recognize that this is the monumental bull elephant that stands at alert in the main rotunda of the Smithsonian’s Museum of National History. It is a relic of the days when it was consider manly, sporting, scientifically justified, and good adventurous fun to shoot large wild animals dead and bring their corpses back to be displayed to heroic effect. As a card-carrying bleeding heart, I cannot help having mixed feelings about this display. As an exemplar of a widespread practice, it is completely deplorable. As an emblem of past attitudes to the natural world and an historic example of how natural science was conducted, it is useful in a cautionary way. As it is currently contextualized in the museum, it is reasonably educational. As an awe-inspiring aesthetic object, it is magnetic. It is compelling, in its frozen pose, in a way that elephants in a zoo or in the open grasslands cannot (and should not) be. A graceful, intelligent, living being has been transformed into a sculpture. As such, I admire it. But let’s not make any more elephant sculptures this way, okay? Most beginning photography texts caution against shooting into the light and for good reason. Direct sun tends to bounce around inside a lens’s optics and create all sorts of unpleasant artifacts like flare and local loss of contrast. And although there may be some areas of the image that are washed out, the rest of it will probably suffer from excess contrast, unless you use a technique like HDR to bring out shadow and highlight detail. So, as a general rule, we are recommended to avoid the practice. In this particular case I was actively trying to make an image with some lens flare to see how the step-down ring I’d bought would either prevent or minimize it (answer: it didn’t). In the process, I ended up with this picture, which I like for several reasons. The first is simply that it is an entirely wintry photograph. I can’t look at it without feeling a little bit of a chill. The bare branches and thin but durable-seeming layer of snow give the impression of well-established cold. The shadows are blue and the light is yellow, but only just. There were some people out walking (you can see their footprints), but they’ve all decided at this point that they’re better off inside. The bright red berries, which you have to look for, give a seasonal holiday hint. The second is the slightly syncopated symmetry of the image. Because it is mostly silhouettes and shadows, it seems to self-mirror both horizontally and vertically — almost. The balanced quality of this image, with the sun right on the center line, was an instinctive composition. It pleases me to realize that I made it on the day of the winter solstice. The year draws to a close. A leaf — once a bud, then green and fresh and juicy, now fallen, caught, weathered leathery and freckled — shows us what marks the passage of time. Even this can be beautiful. And though the days are already growing longer, winter has just begun. Tiny flakes are falling outside my window, and the forecast is for snow, more snow, wind, and cold. There won’t be a lot of sun. All the more reason to huddle close with loved ones, to light candles and other festive illuminations, to share dreams and feed each other’s hopes. This is by far the biggest quilt I’ve ever made; it’s approximately 84″ square-ish. The workmanship is of dubious quality, but I have to say I love the colors, and it was really fun just winging it the whole way. For example: all the cutting was done without a template. I think I used pins a grand total of three times. Everything was done by eye, and as a result there are some pretty gnarly seams and a few places where I just plain screwed up. I’ll probably have to go back and restitch some things at some point (my sewing machine was acting up a bit too). The back is also pieced, in a sort of rectangly nine-patch. The angular quilting looks pretty sweet on the simpler back, if I do say so myself. As is almost always the case, despite the free-wheeling nature of this effort, the whole thing took a whole lot longer than I expected. I imagined I was just going to whip the thing up in a day and half. It ended up taking more like three and a half days (and that’s with utilizing minimum attention to detail). My respect for people who do REAL quilting has grown in the process. I am Ms. Ridiculously Slapdash and I bow before the true craftspeople out there. We are forecast to have a snowstorm tonight and tomorrow, so I’m pleased to have domesticated the pep and daylight that may be lacking for the next 48 hours. And I’m definitely looking forward to all the snuggling I’ll be doing underneath it over the next ten days! 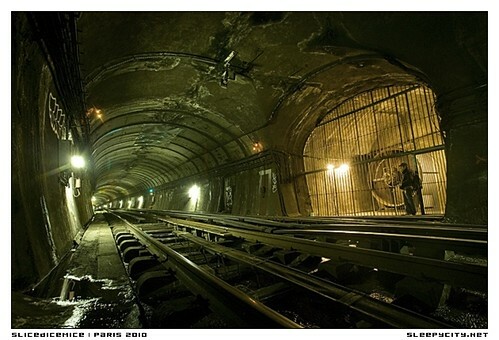 Paris has catacombs, sewers, and the Metro. There’s a lot going on down there! Check out this page of amazing photographs of the subway’s hidden stations, connecting tunnels, and abandoned projects. Here’s another layer-confusion image. The houses in the middle segment are reflections, as is the fortuitously positioned tree in the top portion. This gazebo has no door. You can look through it, but unless there’s a trap door in the floor, there’s no way to be inside looking out. This is completely non-functional architecture. It is also, I’m afraid, not especially attractive either. I rather enjoy its pointlessness, and the way it both enables and defeats the concept of a view. I made this picture on what has become a near-daily run to the post-office. I had received a step-down ring ordered a few days ago, and thought I’d test out its vaunted lens-hood anti-flare properties. Alas, in my (admittedly cursory) tests, the step-down ring made absolutely NO DIFFERENCE in the amount of lens flare. Images shot with and without the step-down ring were essentially identical. Bummer. Yeah, just running from pillar to post here, trying to get stuff done, with mixed success. I’ll admit to thinking escapist thoughts: planes! tropical climes! no marketing! no deadlines! no chores! At least it’s mostly sunny today.